Today we will be introducing a style using a mix of 3 brands, The Viridi-anne , DRKSHDW and 11 by Boris Bidjan Saberi ! .LOGY kyoto 19SS [ RIPVANWINKLE × NILøS ] Brand Mix Style! Today's post is a look using items from ripvanwinkle and NILøS for a jersey on jersey style! ! 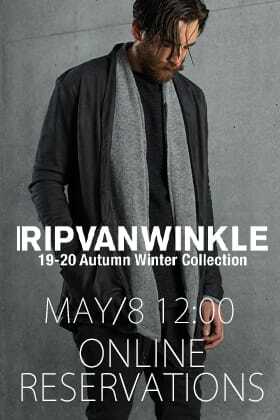 [Release Notice] RIPVANWINKLE 19-20AW Collection Online Reservations starting 8th May! RIPVANWINKLE 2019-20AW (Autumn / Winter) collection pre-ordering starts on Tuesday, May 8 at noon from 12 o'clock on both The R and Online sites. Today, we have another mixed look this time using items from avialae and DIET BUTCHER SLIM SKIN ! 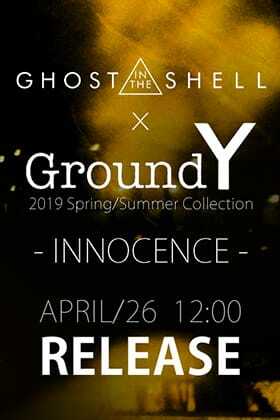 [Release Notice] Ground Y ☓ INNOCENCE Releasing 26th April at 12 noon! Ground Y and the master of Japanese animation world, GHOST IN THE SHELL movie version directed by Mamoru Oshii, has the sequel “Innocence” that will be released on the 26th of April 12 noon. [Release Notice] The Viridi-anne 19-20AW Online Reservations starting 25th April at 12 noon! 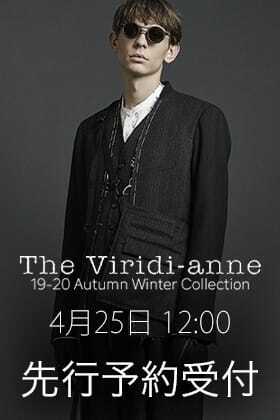 We will be accepting online reservations for the new The Viridi-anne 2019-20AW collection from 12:00 noon on April 25th onwards! Y-3 "Tech Long Shirt & Tech Shorts" setup styling!!! Today, we have a look using items from Y-3 usin the long shirt and short pants! Today we have a DRKSHDW and FAGASSENT mix style that we would like to introduce! .LOGY kyoto 19SS [ RIPVANWINKLE × CIVILIZED ] Cardigan Mix Style! For this blog today, we would like to introduce a ripvanwinkle and civilized cardigan on cardigan style! ! Today, we will be using items from JULIUS, focusing on the Over Silhouette Hoodie! .LOGY kyoto 19SS [ RIPVANWINKLE × ATTACHMENT ] Brand Mix Style! Today, we will be introducing a spring look using items from RIPVANWINKLE and ATTACHMENT for a mix styling! CLANE HOMME "19SS Monotone style!!" For today's post, we would like to recommend a monotone style using the new CLANE HOMME items! They are all great spring pieces so please have a look!